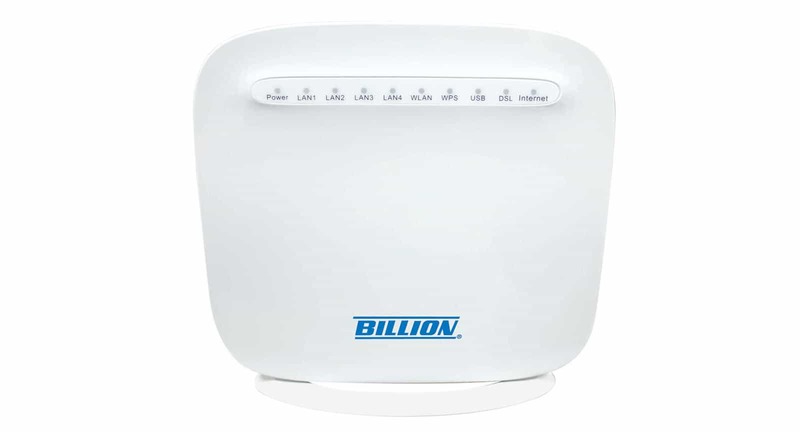 Our favourite modem routers - the Billion 8800NL and the enhanced Billion 8800AXL - provide superb performance and represent great upgrades for broadband users using either conventional ADSL broadband or fibre broadband. For fibre broadband users, they are also fully compatible with G.INP, which is an enhancement implemented on BT's fibre network to improve error performance and broadband speeds further. The good news is also that these are fully compatible with BT's TV service and its multicast delivery of TV content, unlike many other third-party routers. In this article, we show how to set up the Billion 8800 series modem routers to work with BT's TV service. Select the 'Edit' button for the service at the top of the list and here are our initial settings for BT's fibre network. 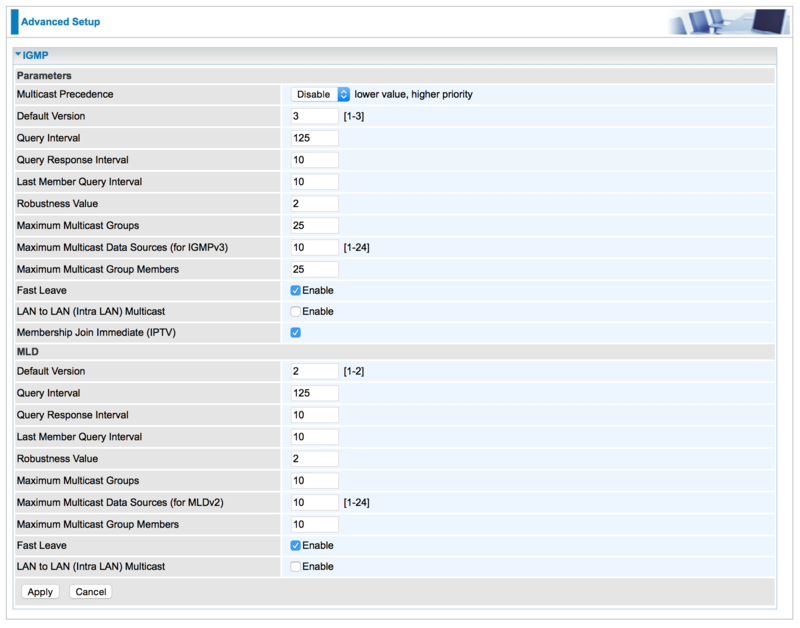 802.1P priority is set to 0, and 802.1Q VLAN ID is set to 101, with a username of bthomehub@btinternet.com. You can enter anything as the password. Now tick the IGMP Multicast Proxy option and then the 'Apply' button, as shown below, and that's all you need to do on this particular menu. Now go to 'Advanced Setup' in the menu, and then 'Multicast', which will take you to the multicast set-up menu. Ensure that you have the 'Fast Leave' and 'Membership Join Immediate (IPTV)' options ticked in the top IGMP section, and then press 'Apply'. Select 'Add' at the bottom left of the screen. 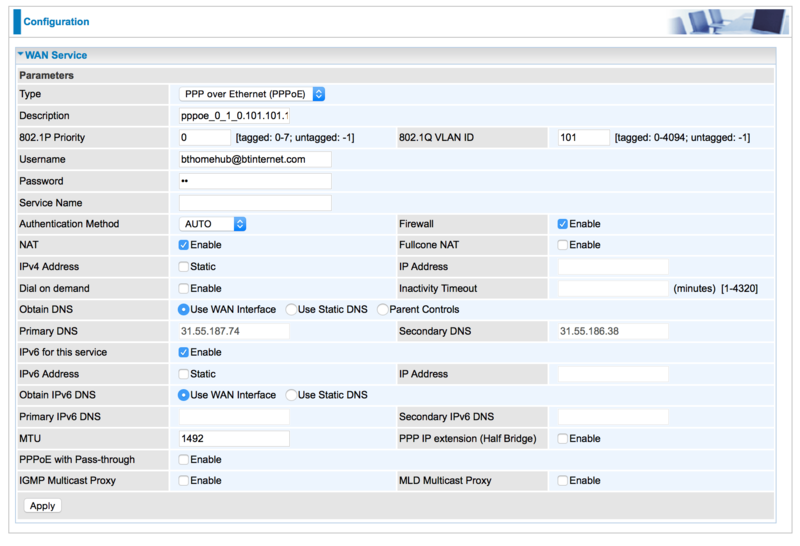 In the options make sure the 'WAN Port' is set to DSL and that the 'Layer 2 Interface' is set to PTM. In the 'Type' box, select 'Bridging'. Then enter zero for '802.1P Priority' and 101 for 802.1Q VLAN ID, as shown below. As the last step, go into the LAN Configuration menu by selecting 'Configuration' and then 'LAN'. Make sure that the 'IGMP Snooping Mode' is set to Standard Mode, as shown below. Set-up is now complete and BT TV should work perfectly! 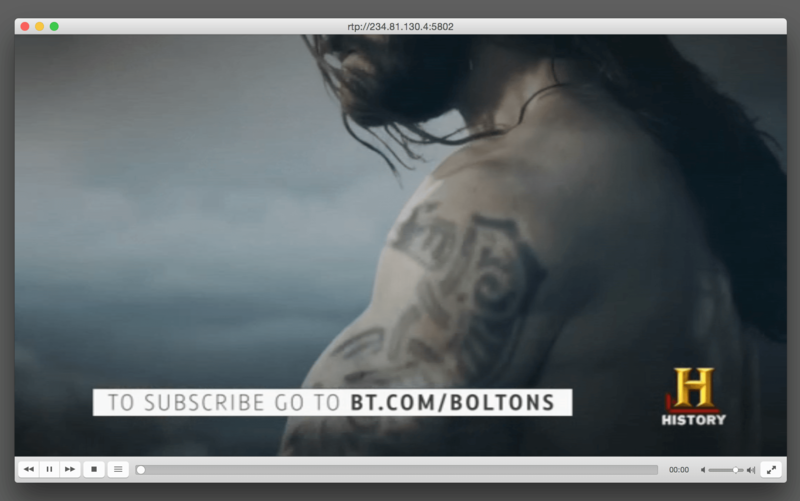 If you have a PC or Mac connected to your Billion router using Ethernet, you can use a media streaming application such as VLC to view BT's test channel. In the VLC programme, select 'File' and then 'Open Network...', and then 'Open RTP/UDP Stream'. 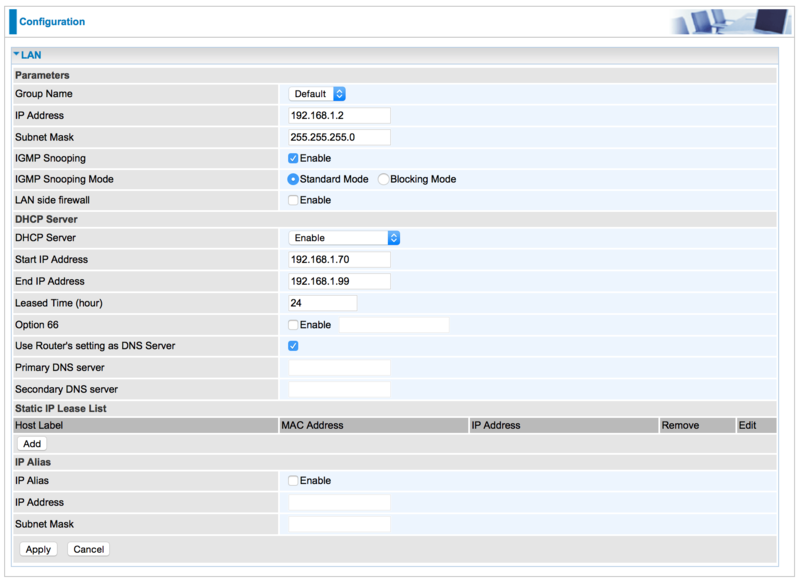 Then in the options select 'RTP' and 'Multicast' with IP address 234.81.130.4 and port number 5802. A window should pop up showing the multicast stream! Please note that your PC or Mac needs to be connected to your Billion router via Ethernet cable as multicast channels generally do not work via a WiFi connection. If you would like to purchase the Billion 8800NL at an excellent price, please consider doing so through the Amazon UK link to the left, which will help contribute towards the costs of running this broadband information site. Thank you. If you have an ASUS RT-87U, you may be interested in our Setting Up the ASUS RT-AC87U For BT TV (Multicast) page.